Carton House clinched the Fred Daly Trophy for the second time in four years with a dramatic 4-3 win over a valiant Galway at Ardglass, writes the GUI. Wins for David Carey, Marc Boucher and Darragh Walsh saw Carton House move close to victory in the final, but Galway made a resurgence with wins by Michael O'Farrell, Paddy Culhane and Eoin Griffin. The climax came when Mikey Burke and Dean Cafferty finished all square after 18. An errant tee shot from Burke on the 19th gave Cafferty the first chance at victory, but he left himself the high side of a difficult pin position and failed to get up and down. However, he made no mistake at the short second, playing a superb medium iron into the middle of the green, and when Burke came up short with his approach and failed to get up and down, two putts was good enough for victory for a relieved Carton House. Galway had earlier accounted for a spirited Douglas side in the first semi-final, with victories coming from Colm Hughes, Cathal Nolan, Michael O'Farrell and Mikey Bourke. 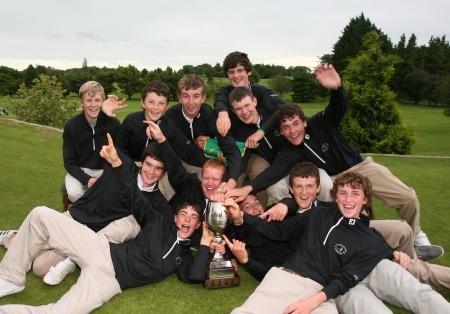 Meanwhile, 2011 champions Carton House saw off Lurgan's challenge, thanks to two vital victories in the top two matches from David Carey and Marc Boucher. Wins also followed for Sean Walsh, Oisin Devereux and Dean Cafferty. Leinster champions Greystones are on course to make amends for last season's All Ireland final defeat to Belvoir Park following their 4-3 win over Rosslare in the first round of the Fred Daly Trophy. Youth Olympic Games — A five over par 77 in the foursomes left Ireland 19 shots off the lead and near the back of the field heading into the final day singles rounds in the Mixed Team event at the Nanjing 2014 Youth Olympic Games in China. Michael Connaughton (Chairman, Connacht Branch, Golfing Union of Ireland) presenting Patsy Lavery (Vice Captain, Belvoir Park Golf Club) with the Fred Daly trophy while team and supporters celebrate their victory in the All Ireland Fred Daly trophy final at Claremorris Golf Club. Picture by Pat Cashman/www.cashmanphotography.ie Belvoir Park clinched the Fred Daly Trophy in a brilliant exhibition of golf, edging out a valiant Greystones side in a high-quality final, writes the GUI.